Q – Do you play sports? 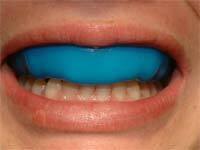 A – If you do, a custom-made sports/mouth guard could be for you. A lot of minor sports groups are making sports/mouth guards a must. Q – Why choose a custom sports/mouth guard vs. a “boilable” one? your sports/mouth guard with you for your regular check-ups and we can check to see if it still fits properly.